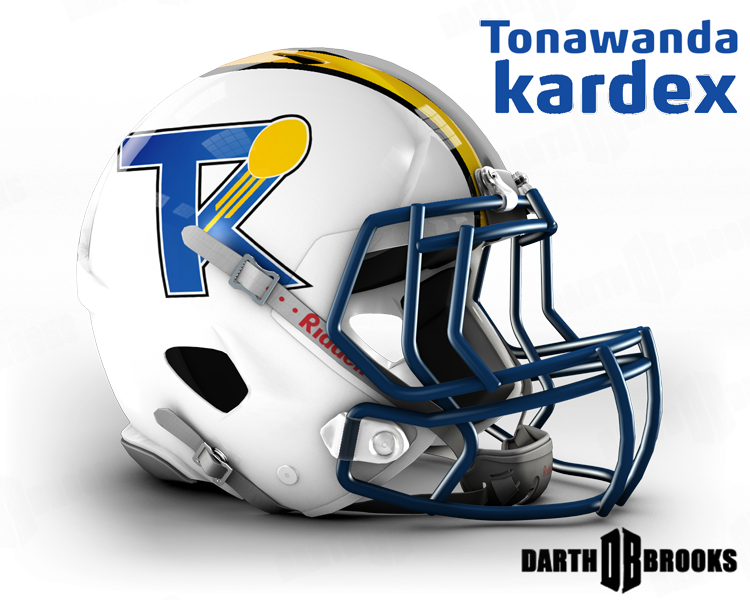 When I did them I kept getting requests for the Tawanda Kardex and the Rochester Jeffs (and other teams) At the time I couldn't come up with concepts I was happy with. Now I do. First up is the Tawanda Kardex. The team is famous for playing a grand total of one game in the NFL. Like a lot of local champions they simply weren't ready to play the better teams in the nation. 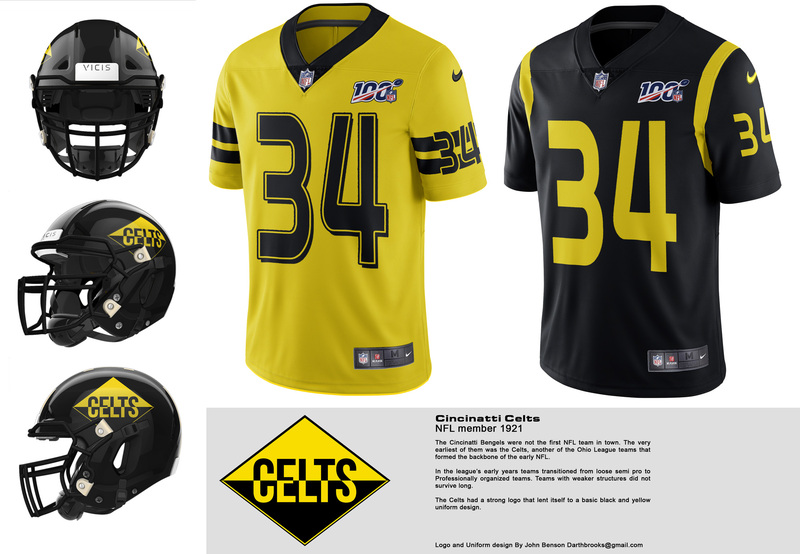 At inception they were very similar to the Green Bay Packers. Local team, subsidized by local businesses made up of semi pro players. Difference is that GB had success early and Tawanda did not. Ironically, the company they were named after still exists. I started with the first name of the team, the Lumbermen. 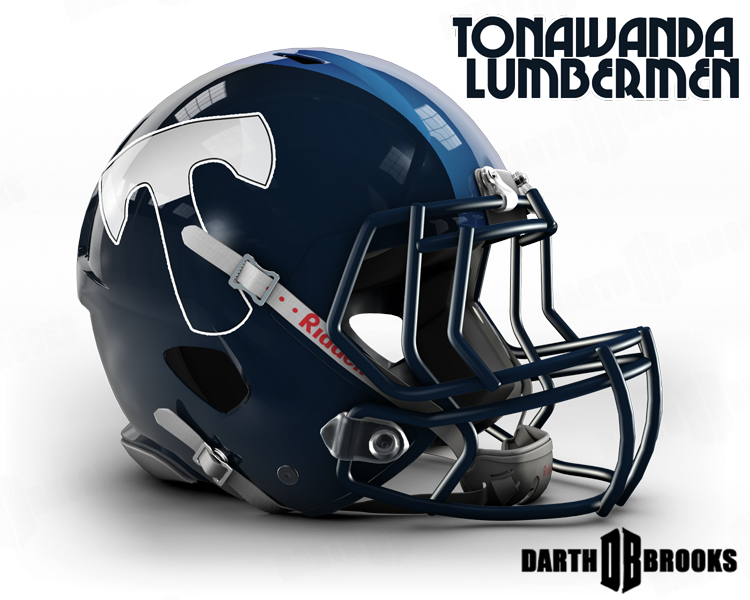 There is a high school team, the North Tawanda Lumberjacks. The high logo didn't really fit this project. This is what I came up for a logo. 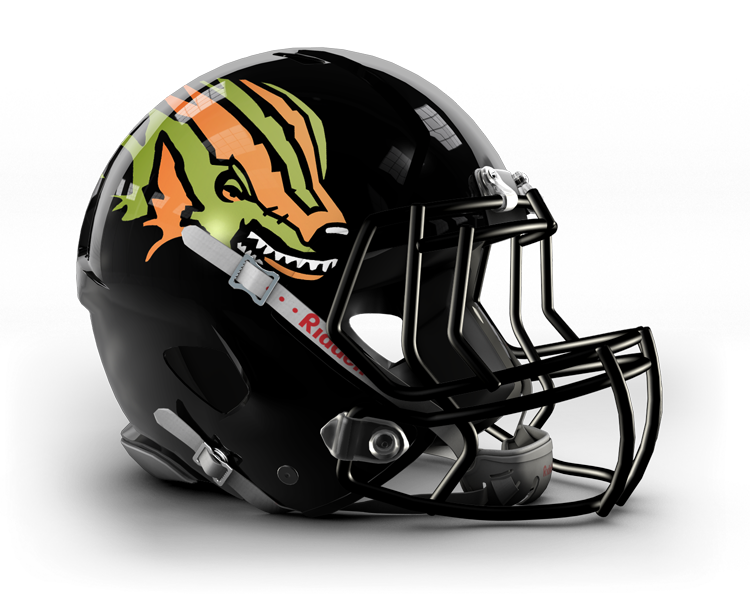 and this is what it looks like on a helmet. "Kardex" was going to be a little more difficult. How do you make a logo using a typewriter? I tried just using the outline of a typewriter but it didn't fit. While driving it hit me to combine a T&K in old typewriter text with the outline of a football covering where they would overlap in the corner. What I came up with didn't work as a modern logo but it formed the basis for a modern descendant logo. The Faux old time logo. Here's the "Modern" logo on a helmet. Here's the Workspace where I figured out my ideas. I'll work on unis later. First, I wanted to revisit a couple of the teams I did before. One of the ideas I had in making the designs was that somehow these teams had survived all the decades that in reality they didn't. It hit me that the team wouldn't keep such a dated logo during the 40's and 50's, 60's 70's etc... This is meant to be a Descendant of the original design, refined down to repeated triangle shapes within a larger triangle. I wanted to get rid of the feathers in the old design. It was too close to the Redskins and I wanted Native American iconography in the design. Tell me what you think. Well, does anyone want more of these or should I let this die? 200+ views, no response is really discouraging. I like these a lot. I'd love to see full unis and everything else. I especially like how you showed the workpage for Kardex. One thing I think a lot of newer designers don't realize is the amount of work that goes into crafting a logo. 90% of newbies' logos are clearly first drafts of the first idea that popped into their head. I'd also be interested in seeing more of the history of the original logos on up to today (which includes as many of your faux old-timey logos as you want if real ones don't exist). Not knowing what the Lumbermen's historical logos looked like makes it harder to gauge or comment on your current design. 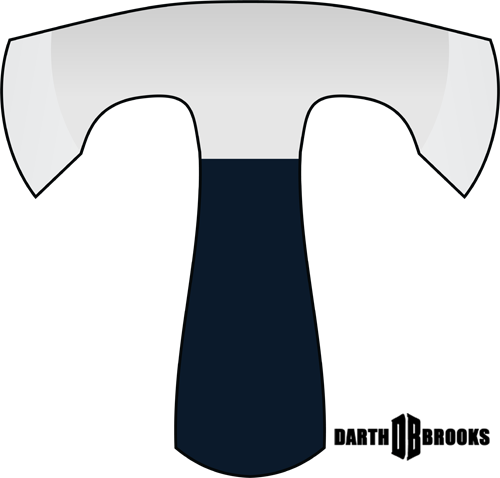 The axe logo feels a bit underdeveloped, but like Green Bay or Cleveland, if it's paying direct homage to a historical logo, my evaluation and feedback will be different than if it's a pure modern logo. The Indians feels like the most fully-formed identity of the ones posted here. However, in spite of the history of the name being Indians, by 2018, unless they were as obstinate as the Redskins, the Indians would probably have changed their name. That sort of thing is fun from a fictional standpoint, when teams have to account for fans' aesthetic or social backlash. Make it part of the history of this team. The Triangles feels a little underdeveloped. I get what you are going for, but the triangle as used isn't iconic enough yet. It needs to feel like this is the ONLY triangle that looks like this and it's the only icon that can possibly represent the Dayton Triangles. Kardex, that's a weird team history, and as such, I think you can more stick with the historical aesthetic roots. The new logo looks like the logo the team would have come up with in the 70's that was then abandoned for the retro logo in the 2000's. Go back to the drawing board using your faux old logo and find a way to meld old and new. Look maybe to Juventus' modern update of their logo that still feels old-timey (if you squint hard enough). As to getting responses, maybe make it more clear what sort of feedback you're looking for. Your logos are generally well thought out and cleanly produced, so it's clearly not beginner help you need. If you get feedback, do you normally incorporate that and post updated versions in a timely manner? Or is the feedback you get just something you'll internalize and maybe incorporate into the next newer logos you create? There's nothing you're doing wrong, just nothing really prodding feedback. These are great! 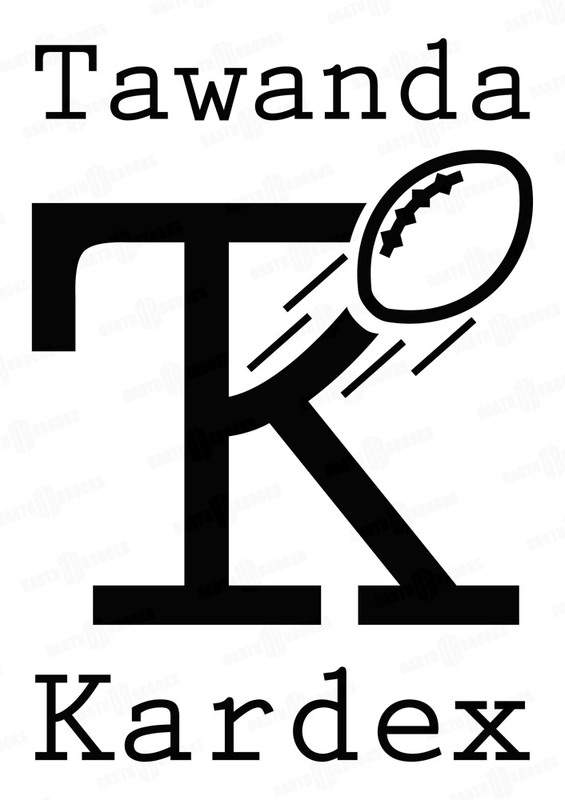 I’ve been searching for the logos of old NFL teams to redraw them, and send them to the site. There is one problem with this thread though, which is that “Tawanda” is spelled Tonawanda. It’s a suburb of Buffalo. I have that right in the "new" concept but wrong in the old. I'll have to fix that. Now that I've thought about it, I could have just gone with the company logo for Kardex. Super interested, was thinking of doing something similar myself but haven’t got around to anything. 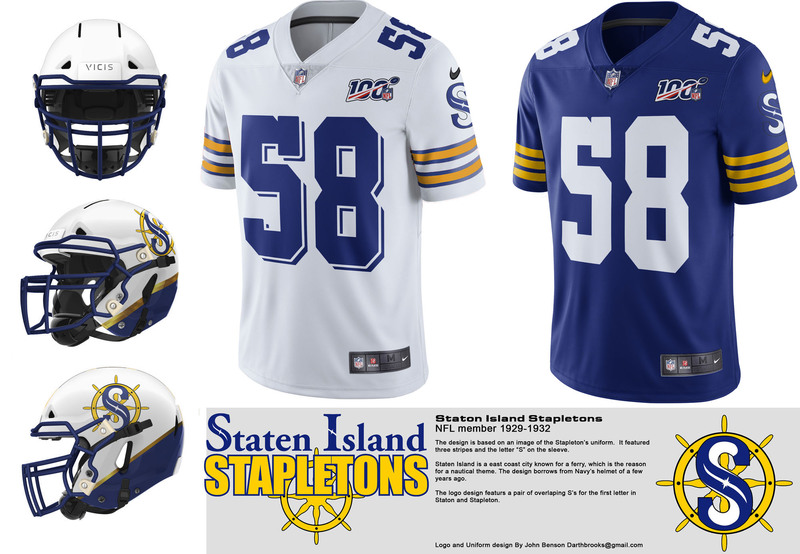 In a way this could be your own universe, rewriting nfl history, reimagining the league with a whole new set of teams. You’ve got the skill and it would be super interesting to see. Looking at the current ones, I like the Kardex, even though I would assume the name would change, the logo is cool and the made up history behind it works. I’d like to see Dayton on a flat, 2D surface but from what I see, I’d try making it an equilateral triangle. Oorang reminds me too much of the New Mexico flag before anything else. 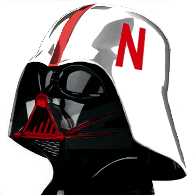 I REALLY like that wraparound logo on the helmets. It's one of the few times I've seen it where it doesn't look ridiculous. Milwaukee Badgers? It’s time. 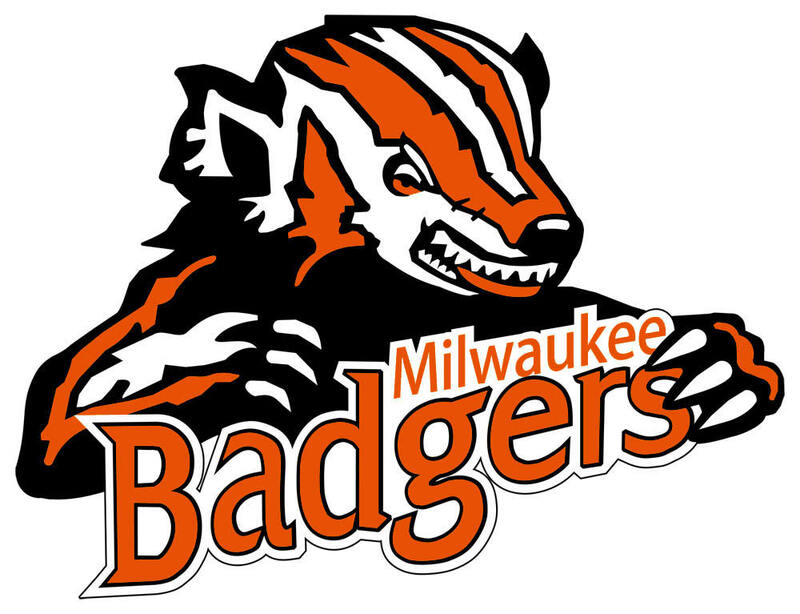 While looking for old logos I found one that was probably the Badgers logo. I hope it’s real because it’s very advanced for its time. It looks, dare I say, decent by today’s standards. I'm rebuilding the Badgers logo based on the first one of those, because that was the only one I found. That second image is super clear, even though they are both tiny. It really is a great logo. Did you notice the "M" in the design? I didn’t notice lol! But I see it now, on the badger’s head. 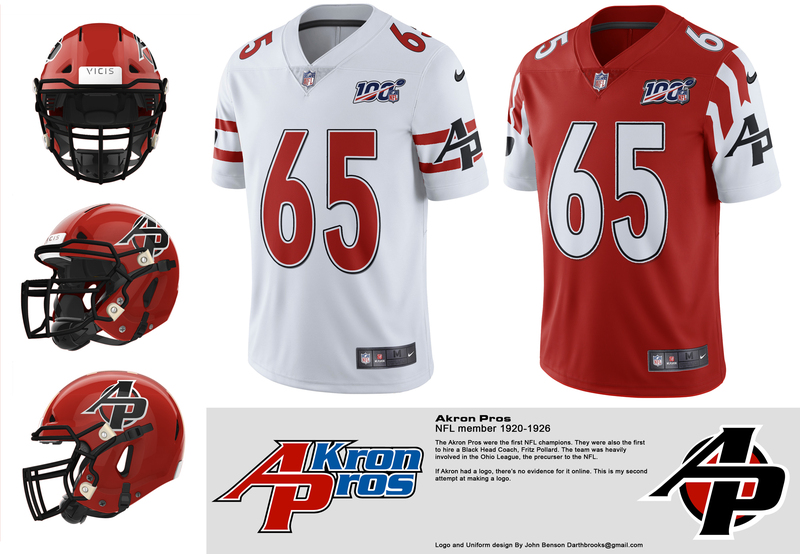 Giving the Akron Pros a go. Logo is mine as is the template. (The Zero One helmet) Once I get the bugs ironed out I might release it. Team ended op with a very 70's feel to it. I may have to go through and modernize the modernized helmets. 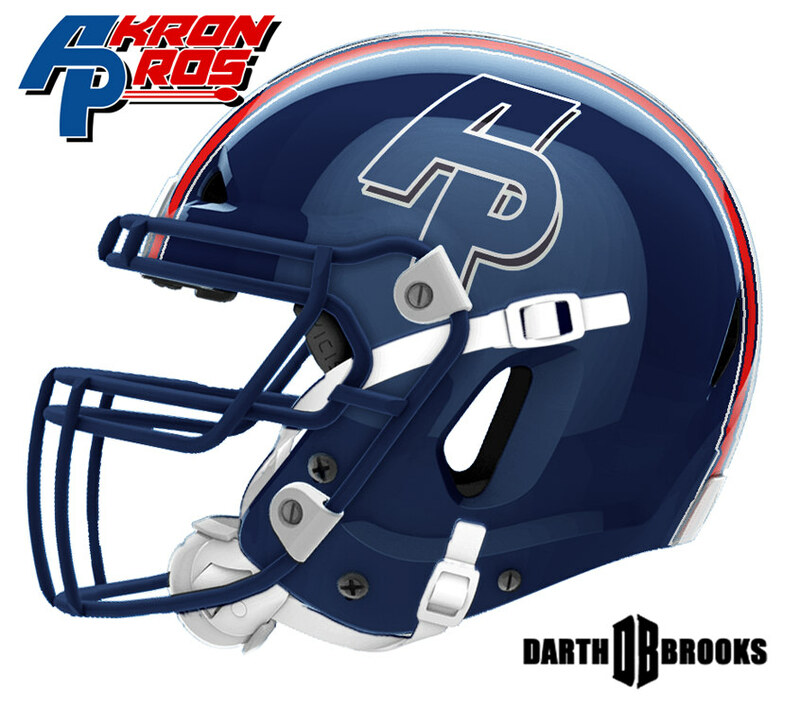 The Akron Pros were the first NFL Champions. 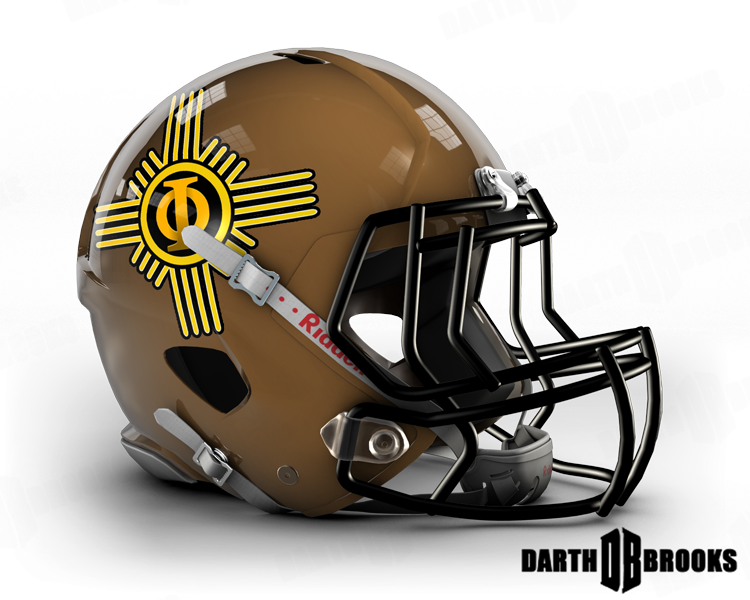 I figure that if they had survived they would be The prototype NFL team, the one you always saw on cereal boxes and in comic books, so I went with an elemental design for the helmet. Primary colors, with the logo echoing the US flag. I have some tweaking to do but I wondered how the Badger logo would look on a modern helmet. I wonder if the red and white one is the real logo or a bad copy of the real logo and if the green and orange is real or a recreation. Redid Kardex, adding in all of what I've been doing. 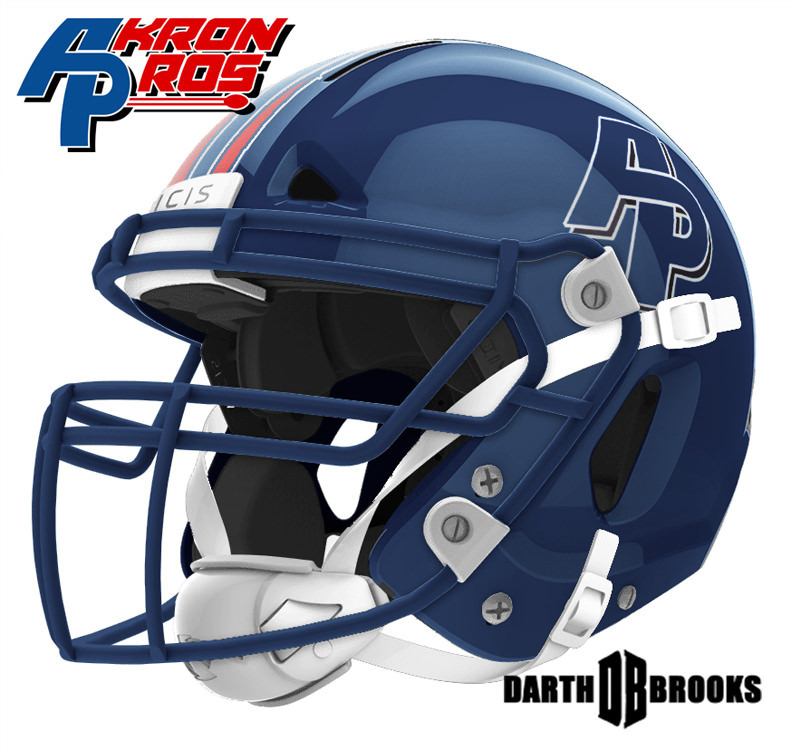 Really liking that Pros AP logo, although the K in akron doesn't need to be capitalized. I think the Kardex is a downgrade from your previous edition. The whole script doesn't need to be on the helmet. You're right about the K in Akron. 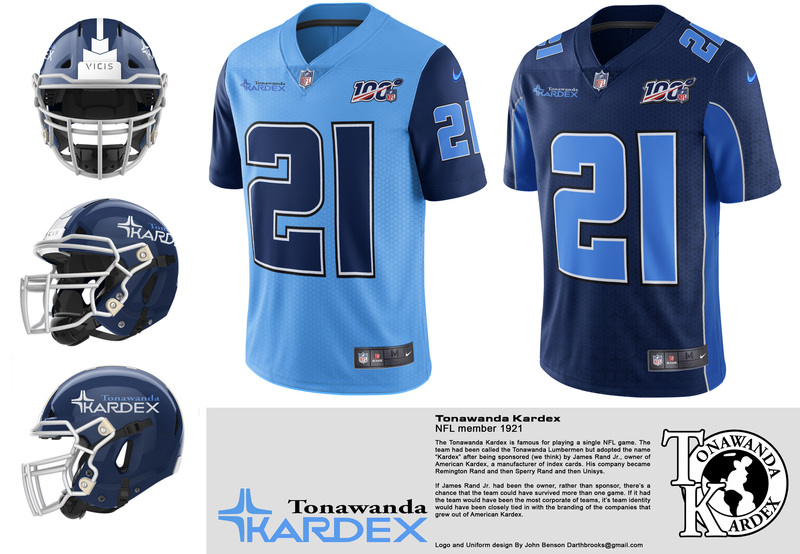 It may change, but the reason I put the full name on the Kardex helmet in is, in essence, this version of Towanda Kardex is owned by a corporation. How does a corporation think about branding? They're gonna put in the full name, right? Lol. At least (as far as I know) I spelled it right on the concept.